Don’t you find Care Bears 'oh-so-sweet'? I grew up in the era where I looked forward to Care Bears every week on TV! I always loved their “Care Bear Stare” (a.k.a. tummy power), where they will stand together to radiate light from their tummy symbols which combine to form a ray of love into the target's heart!! So magical and sweet! So I was super thankful that I got the chance to make my childhood fave! 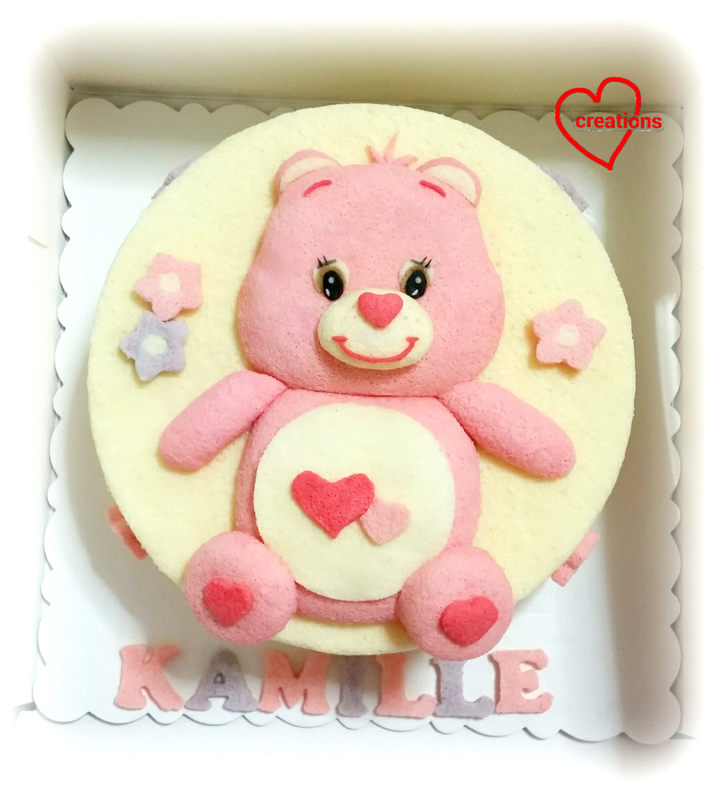 The pink Care Bear is made entirely from Strawberry Chiffon Cake, baked in 3 oval glass bowls (1 for head, 1 for body and 1 for arms which was cut into 2 and then carved a little; baking temperature 160°C , 15 min then 150°C, 15 min). The ears and feet were also from Strawberry Chiffon Cake baked in my silicone cake pop maker (160°C , 15 min). The base chiffon cake is a 9-inch Reduced Egg-yolk Vanilla Chiffon Cake (below). I baked the excess batter in a baking paper-lined tray for cutting out the tummy pad and ear pads etc. The rest of the features were similarly cut out from chiffon cake baked as layers and stuck on with melted marshmallows. *I always use more egg whites to egg yolks for fluffier, softer chiffon cakes, as well as steam baking for increased moisture (such that they taste like ogura). *I also whip usually to firm peaks (or just to the point of stiff peak, but not beyond) for more delicate texture. 1. Preheat oven to 160°C. Prepare a tray of water at the bottom of the oven (I used the lowest rack to bake the cake). *You may omit steam baking; I like to use it to control my oven temperature rise. 4. Meringue: Beat the egg whites with ¼ tsp cream of tartar till firm peaks form or just to the point of reaching stiff peak, mixing in caster sugar in 2 additions. 6. Pour the batter into the chiffon tin from a height. 8. Bake the chiffon cake for 15 min at 160°C and then at 150°C for 10 mins and 140°C for 20 min, then 130°C for 15 min. 10. Unmould by hand after the cake is cool. Gently pull the cake from the sides of the tin at each angle and push the removable base up to unmould the sides. To unmould the cake from the base, gently lift up the cake from the base using hands, repeating this at each angle before turning the base over (see 'Hand Unmoulding Chiffon Cakes for a Smooth Finishing' video tutorial). So thankful to make this cake and that the birthday girl exclaimed Care Bears and they loved the texture!